I fell in love with a Targa 20 years and now I’m in a place to finally own one! There are a few for sale at the moment with a wide range of prices. My budget is sub £40k - is any of these currently known to anyone and can they vouch for any of them? Or perhaps more importantly, nay to avoid......? Should I go manual or tiptronic, any thought Re driving styles, valuations etc....? Some vehicles for sale seem to have been for sale for sometime, year without being mot’d etc - will this lengthy period of inactivity cause in short (or long) term issues? For example is there a correct way to store them or issues to look out for as a result of incorrect storage? 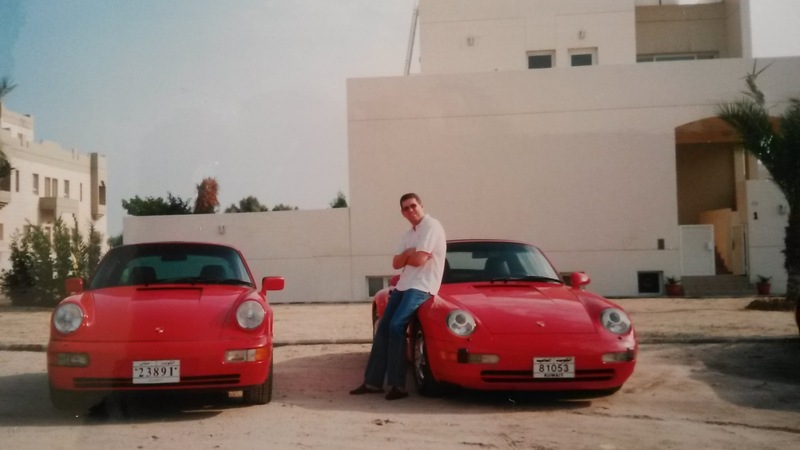 I have owned both a 964 Targa C4 manual and a Cabriolet C2 Tip S which I have owned since 2000 and have here in Spain. The 964 Targa of course had to have the roof panel removed by hand where as the 993 Targa is electric, however, it wasn't a big deal. The car was amazing and stuck to the road like glue. However as I said a Cab was my target car and when one came along I jumped at it. It was just over 4 years old with 19000 Kms on the clock, had been owed by a young Kuwaiti girl and had full OPC history so a good buy. Many will say that a manual is the way to go and demands a higher price, however for me a Tip S has been great. It's so easy to drive in heavy traffic and with the Tip S buttons you can have, as far as I'm concerned as much fun as I did in my Targa C4 manual. If you look at performance, the Tip S is only fractions of a second slower than the manual. I've said on here before that you would need the skills of Lewis Hamilton to benefit from the difference. For me it would have to be a Cab, I have always loved open top motoring since owning my first car, an MG Midget in BRG. Obviously for me having always lived in sunny countries it is perhaps an easy choice but I can tell you when the sun is shining and the sky is blue there is no better feeling when driving, the old wind in the hair and the sun above. Can't help you out with any specific cars as I'm not in the UK. Trev I'm sure will be along to give you his opinions on the 993 Targa. He has one and has been on a rebuilding project over the last year or so. What he doesn't know about his car isn't probably worth knowing. I'm pretty much coming to the end restoring my 993 Targa, I bought the car damaged and it should be ready for the road soon, I'm a bit of a spanner guy so I bought the car as I gain lots of enjoyment from the restoration process (not for everyone). Having not driven the car (as yet) I cannot comment on that side of things, but I've gone for a few subtle well known mods. During restoration I'd say I've spent 40% of my time/expense fixing original damage and 60% of my time/expense getting the car as I'd want it. It could be argued I've gone overboard however it just goes to show what you can find wrong with a 20yr old car if you look hard enough. There tends to be massive 'whilst you're in there' scope creep. If handy with the spanners and you enjoy that sort of thing you can afford to get something that needs a little tlc, if you don't and all you want to do is drive then you're better getting a very good example and paying the price, that said even excellent examples need work. The 993 Targa is a beautiful vehicle and looks stunning particularly from the back. The Targa specific Speedline split rims can suffer and you need those to pop so ensure in good condition or have them restored. Don't be tempted to put 18" wheels on a Targa!!. However be wary around that roof, it needs to work perfectly and those seals need to be good or water ingress will happen (I've changed every seal on the roof mechanism), water drain holes need to be clear, check along top of rear quarters for rust as fixing this requires roof off and that's very costly if not doing yourself. Gearbox depends on you, your use case and preference. Personally I'd get a manual every time but they command stronger prices and check if clutch is ok, swapping out clutch is expensive. The 993 I fell in love with back in the 90s was a targa too. Ended up getting a coupe 4yrs ago and occasionally regret not going for it. The coupe is lovely but as an occasional car, I do lust after a bit of open top motoring. Whether the targa would fully meet that requirement I'm not sure. I'm now looking at 964 targas as I love the look and think it might offer something a bit closer to full open top driving. Why don't I go for a cab? I've always though the 911 lines are spoiled by the shape of the soft top. Tip vs manual? Personal preference. Tip is great in traffic and very easy to drive. If it had an extra cog it would be perfect. I was at the launch in 1996 at the Earls Court motor show, mesmerised by the roof sliding back and forth all day, swore I'd get one one day..
After a couple of 3.2s a 993 coupe, 964 coupe I've settled on the Targa, a beautiful car to own, the 6 speed gearbox is a must over the 964 (loved the 964) I've upgraded the suspension, I run 18" wheels with no issues, changed the cats (essential) had a remap on a rolling road, bypassed the silencers, etc etc, always puts a big smile on my face, a great car winter and summer with a glass roof! Sorry to go on, if your near the Fairmile, weather permitting, it will be there..
993 Targa, factory aero, Powerspeed 200cell cats, Hollomby bypass, HIDs, Koni FSDs, M033 and the wrong wheels.. I had a 993 Targa many moons ago, an absolutely lovely example. If I had my time again I should not have sold it. Something very special about going along with the roof blind open and it has a style all of its own. Like Chris above, I was similarly mesmerised by the example at the motor show! I would personally go for a manual, because the tip is only 4 speed. It suits it quite well actually (its a more 'laid back' car than a coupe), but the manual 993 box is particularly good. Make sure you have the split rim alloys as they are great looking. They are a bit wobblier and creakier than a coupe, goes with the territory as its the cabrio body and the roof is quite complex. Watch for corrosion. As I wanted a high days and holiday 993 I could also drive to France and back on a yearly basis in the summer, the Targa was my 993 of choice. Over two years in I do not have a single regret. Go for it, being able to open that sliding roof on summer days and with the incredibly light interior with the roof closed it cannot be beaten imo. Absolutely love it. I was never a big lover of Porsche 911s but I still remember the first time I saw a 993 and decided then and there that I would have one eventually. My only regret is that I didn’t buy when prices were low. There is only one car more beautiful imo and that is an Alpine Renault A110. I totally missed the boat on buying one of those. I love how small both of these cars are. I had a 1996 Targa. Loved the glass roof, I dont think I ever had the blind drawn so that even on cold wet miserable days the car had great light from above. Having the roof open even on cold days was a great treat. The roof! now mine never leaked so maybe I was lucky there, but boy did it creak and grown and have wind noise when it was closed..... I had it serviced regularly but could never git rid of those noises. You do lose some rigidity by having a big gap in teh roof but assuming your'e not tracking it then its barely noticeable imho. If I was choosing over Id would 100% go coupe, never a cab fan and the benefits of the targa didn't overcome the negatives.